The Other Modern at the "Other Dominican"
Another Regrettable Cathedral for California? 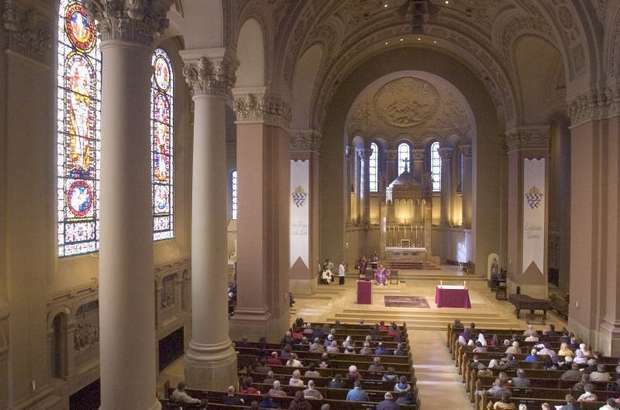 Monday of this last week (July 25), the historic St. Joseph Cathedral in Sioux Falls, South Dakota, marked the completion of its renovation with the blessing of the cathedral doors and a sneak peak inside. (NLM wrote about the restoration back when it was on the drawing board in 2009). 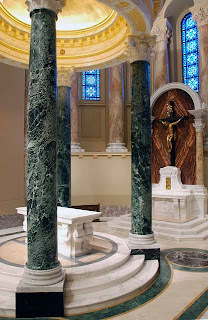 St. Joseph was designed and built by French Beaux-Arts master Emmanuel Masqueray (1861-1917) from 1915 onward, being completed after his death; the renovation, which included the creation and installation of a new baldachin, altar rail, ambo and more in a complementary classical style, marble flooring, and a new, more vibrant color-scheme, was helmed by Duncan Stroik, who needs no introduction here, and includes a number of sculptural works by Cody Swanson, a young master and teacher at the Florence Academy of Art, including crucifix, ambo relief, cathedra tympanum relief, altar frontal reliefs and monograms, baptismal font artwork, and the angels ornamenting the baldachin. The event will be further celebrated by a concert of antiphonal sacred music (sung by double-choir and accompanied by brass and organ) including works by Gabrieli, Guerrero, Monteverdi, Bach and Dupre on September 2 of this year. 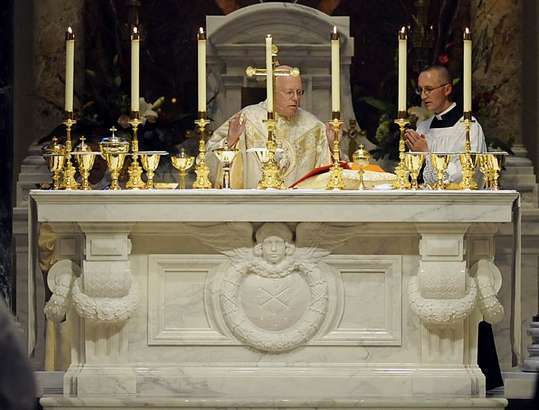 The renewed interior is a model for an approach to church re-ordering that is both sensitive to the past while still developing a distinctly new beauty within the liturgical and artistic tradition of the Church. 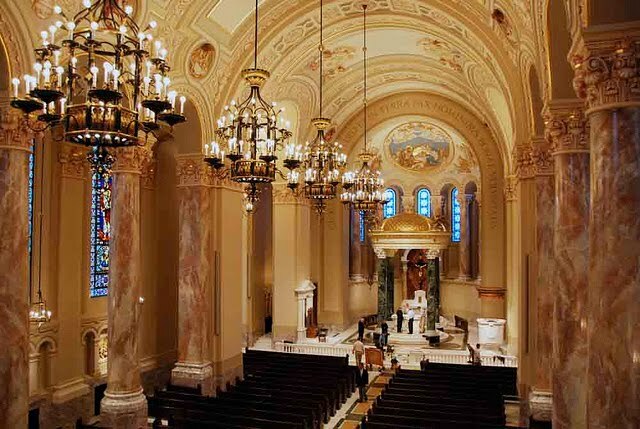 Past progress on the project can be found on a photo gallery on the cathedral website here, and a couple of photos of the stunning renovated interior follow below, courtesy several alert readers, and also from Mr. Stroik's site. 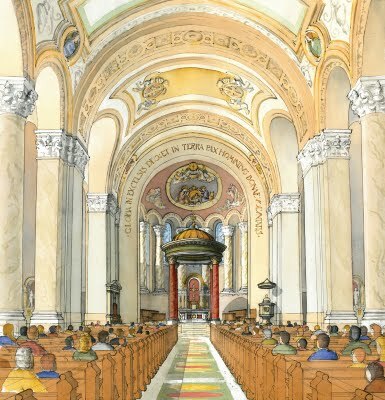 And here is the original architect's concept drawing for the interior. For comparison purposes, this is what it looked like before: note not only the oddly-placed altar but the generally drab paintwork, and then look at the new images again.